The illustration shows the musculoskeletar system of human body in three poses. I decided to show only certain muscles and tried not to cover all sceleton with them, to accent that all those parts in human body work together. I didn't want to make borders between them, I rather wanted to show their cooperation. 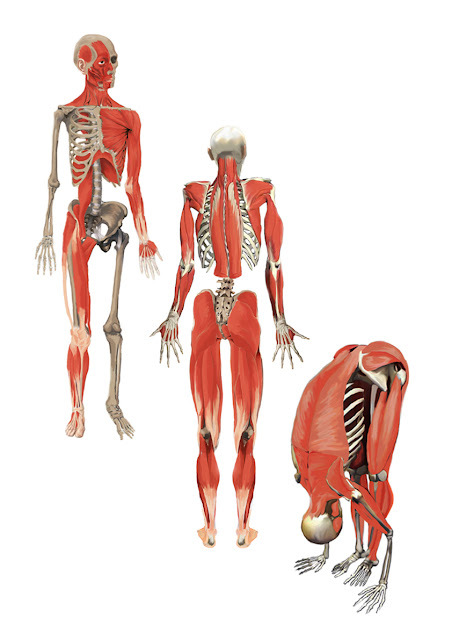 It's locomotor system, so the thrid pose is a body in motion to accent that, but the two standing poses show that even if we just stand, some of our muscles are in tension; our locomotor system works even if we don't make any specific moves.